We’ve been meaning to post this for over two months now but sometimes life happens and you completely forget. Do you know what we mean? So, in an effort to get it back to its former glory, PJ began fencing in part of the side yard that runs the whole length of our house for the big girls to stay in during the majority of the day. This, plus planting some grass seed should do the trick in making our back yard welcoming again. 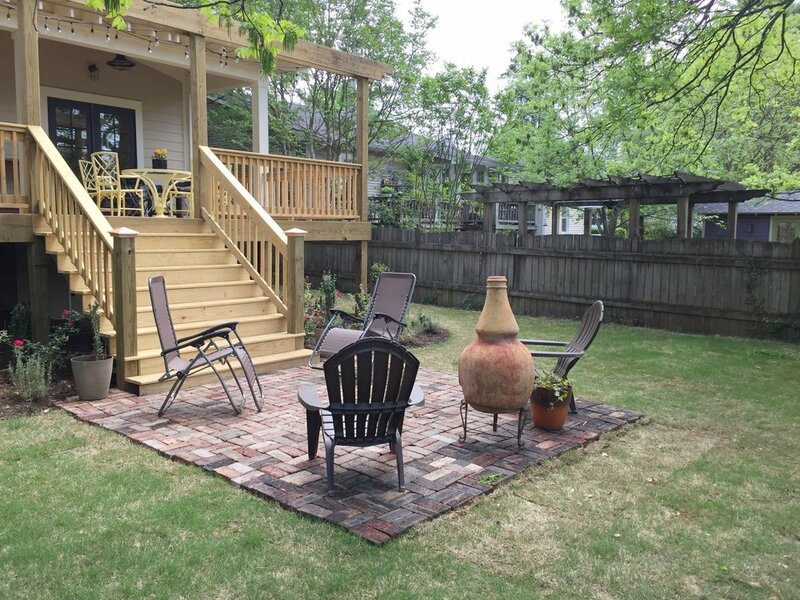 We also plan to remove the brick patio some time soon and just do grass there. It's beautiful, for sure, but our yard is small as is, so this will at least give us some more grass to walk on. We'll relocate the bricks somewhere else. They are bricks we saved and cleaned from the chimney we took down in our kitchen while renovating, so we won't be getting rid of them anytime soon :). You can't tell from this picture, but they're SO EXCITED!! See the dirt with all of the little footprints in it? That's almost what our entire back yard looks like, but with little patches of green scattered throughout. We aren't even gonna show you. Maybe one day when we have a really nice "after" shot haha.